Fall is the time for pumpkin lattes, pumpkin pies, fall festivals and trick-or-treating! Atlanta has many Halloween themed events from visiting pumpkin patches to getting scared at Halloween staged attractions. There are many fall festival, pumpkin patches and Halloween events that are for the entire family in the Atlanta area. These activities are catered more to families with younger children. 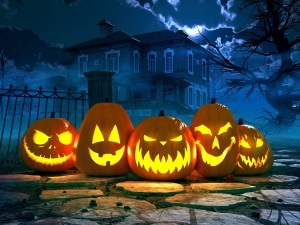 Check with your local city for more information on Halloween celebrations in the community. Below is a list of just a few of the fall festivals, pumpkin patches and events in and around the Atlanta area. Jonesboro First United Methodist Church host their annual pumpkin patch until October 31st. The Pumpkin Festival is Saturday, October 24th with food, crafts, fun and games. There will be a costume party on October 31st with costume contents for the entire family. Plus, don’t forget to pick up your seasonal pumpkins, gourds and decorative stalks. The big fall festival in the Atlanta area is at Stone Mountain State Park’s Pumpkin Festival. The festival has costume parties and contests, crafts, family shows, a spooky maze and more. To go along with the spooky season, there is also the Tour of Southern Ghost Storytelling Festival through October 25th, where ghost stories are shared as guests walk along the lantern-lit paths of the Antebellum Plantations grounds. Uncle Shuck’s Farm hosts a pumpkin patch fall festival with corn mazes, hay rides and other family activities through the Halloween season. Families can explore the corn maze, create or find fall decorations, discover the perfect pumpkin and much more. At dusk, there is a haunted maze, bonfires and hayrides. The Atlanta Zoo offers its annual Halloween celebration, Boo at the Zoo Saturday and Sundays, October 24, 25 and 31st. The family event has trick-or-treating, crafts, costume contests, an inflatable corn maze and entertainment in the zoo setting. The Owl O’ Ween Hot Air Balloon Festival is held at Kennesaw State University October 23rd and 24th. The festival features a balloon glow flight, tethered hot air balloon rides, trick or treating, extreme pumpkin carvers, food vendors and more. There is an interactive kid’s zone and many stages for live music and entertainment. There will also be an Oktoberfest celebration for the weekend! The Netherworld Haunted House in Norcross, Georgia, has been voted the best Halloween attraction in the Atlanta area for multiple years. This walk-through haunted complex has live actors, special effects and incredible monsters. It has been featured on Travel Channel and CNN. Netherworld is open every Friday and Saturday through November 7th. Fright Fest, Six Flag’s annual Halloween celebration at Six Flags over Georgia, runs on select nights through November 1st. By day, the park hosts family friendly costume contests, arts and crafts and other special events. By night, the park is transformed into a haunted amusement park with scare zones, frightening rides and haunted houses. 13 Stories is a 13 story haunted house filled with multiple haunted houses. This haunted house is made to be more intense and scary than your typical haunted attractions and has been nominated for the 10 best extreme haunted attractions in the country. 13 Stories is open through November 13th. There is so much to see and do for the Halloween holiday in the Atlanta area. Storage World is proud to be part of the great Atlanta area. Stop by any of our 3 Atlanta self storage locations in Decatur, Jonesboro, or Stockbridge wishes everyone a safe and Happy Halloween!